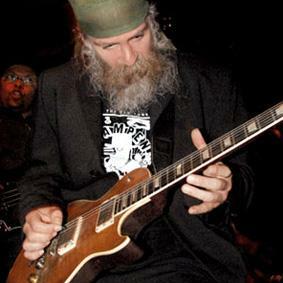 FreeMan is a highly energized bluesman with a repertoir that spans from down home style delta grooves to high octane funk, via a large portion Chicago roar and motown beats. His emotional guitarplaying and hardbelted Vocals leave no one unmoved. He performs his trademark extended solos that range from a whisper to full on primal screams, taking the crowd to a frenzy, all the time on the edge. Armed with a solid pack of original songs and instrumentals, influenced by the likes of Muddy Waters, Jimi Hendrix and Hound Dog Taylor among others, He throws in his own interpretation of the occasional classic as well. A FreeMan concert is a passionate,sweaty and dynamic affair – The blues at it’s best! The CD “No illusions” is available by contacting management. FreeMan is currently working on two additional projects, including a mainly acoustic album. In addition there are many demands for a live DVD to do better Justice to the experience of a Maxi Dread show. However, there is simply no substitute for attending in person. Look out for a show near you!